2.2.1 How Paintless Dent Removal Works? 2.2.2 Is glue-pull dent repair safe? 2.2.3 What are the benefits of paintless dent removal? 2.2.4 What are the differences between paintless dent removal and traditional dent repair? 3 Why or Why Not to Use a Certain Type of Dent Puller? Many people tend to head to their local body shop to get minor hail damage or small dents removed from their vehicles. This can get very expensive if your car insurance does not cover the repair cost. The good news is small dents and minor hail damage can be taken care of by anyone with even a little mechanical ability. There are many DIY dent pulling kits available online and in auto stores everywhere. If you read this article it will help you find the best dent puller for your needs. How will we help you find a top of line dent puller? We will start by doing some dent puller reviews of the best models. After that, we will discuss the main components of dent pullers. We will even give you a lot of other useful information on dent pullers too. When you are finished reading, you will then know how to find the exact dent puller that perfectly meets your individual repair needs. If you are looking for a versatile paintless dent puller you will certainly want to take a look at this product. 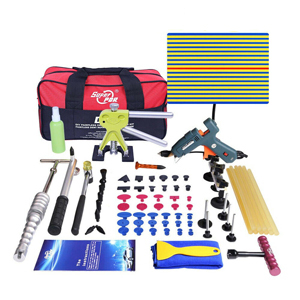 Super PDR has come up with a 52-piece kit that will give you many options for pulling out small dents. Everything that’s needed to start pulling out dents right away is included. It’s really priced great for all you can do with it too. This particular kit uses small pads that you securely glue down over the dent (many included). You then grab the pad and pull out the dent using the bridge dent puller, golden dent puller or the other hand pulling devices in the kit. This lifetime warranty kit even includes a glue gun, several sticks of special adhesive glue and a carrying bag. This is the dent pulling kit on our countdown of the best ones that will give you the most options. The kit includes an amazing 92-pieces of dent pulling equipment. It’s a glue style dent removal kit that includes slide-hammer, bridge, and golden dent removal tools. This AI designed dent pulling kit is even good enough for professional use. 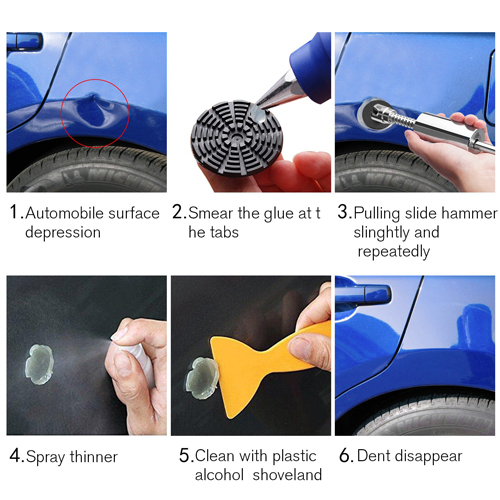 There is nothing else to buy to get started using this dent pulling kit right away. It even includes the hot glue gun and several glue sticks. Also included are 52 different plastic glue tabs that will help you pull out many different size dents. This kit comes with its own carrying bag too. Here is another nice dent removal kit from the reputable manufacturer Super PDR. It too is a fairly versatile dent pulling kit thanks to its 32 working pieces. This dent pulling system uses a combination of glue tabs and several different types of dent pullers to get the job done. 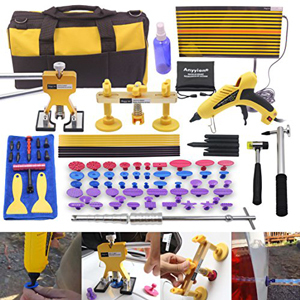 There is a golden dent pulling tool and bridge dent puller included right in the kit. 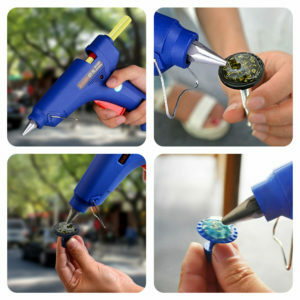 This glue style dent puller also comes with a hot glue gun and several sticks of glue. Also included are a dent leveling hammer, 20 plastic glue tabs, and 6 flattening pens. It’s a dent pulling kit that is suitable to use on cars, refrigerators, washing machines and other items with dented sheet metal. Here is a tool that will allow you to quickly pull out dings and small dents in automobiles. It’s an easy to use 3rd generation bridge style dent puller that works in conjunction with glue tabs. Bridge dent pullers use leverage to slowly and evenly work out dings and dents. No painting has to be done afterward. Inside the kit, you will also find 10 different sizes of plastic glue tabs, a cleaning cloth, and alcohol. It must be noted that this kit does not come with the required glue gun or glue sticks. Manelord backs your purchase up with a no questions asked 30-day money back guarantee. This is a very affordable and easy to use slide hammer style dent puller. It really makes pulling out small dents somewhat effortless on the user’s part. Best of all, it works in a way where no painting needs to be done afterward. You also get everything you need to use it right away in the kit. The pro-grip slide hammer dent puller is made of durable stainless steel. It also features thicker plastic glue tabs that hold up better when applying dent pulling pressure to them. There are 16 dent pulling tabs in all which allows you to work on several different size dents. 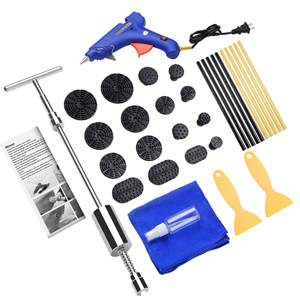 The dent puller kit also includes alcohol, cleaning cloth, and scrapers. This is a dent pulling kit that uses a very popular golden style dent puller. People like them because they are simple to operate and do not mark your cars body surface as you use them. There also is no need to repaint after pulling out a small dent with this type of dent puller. It’s a great dent pulling kit for the price you will pay for it. One of the best features about this kit is its wide variety of glue tabs. It has 24 of them at all for many dent pulling choices. Also included in the package are glue sticks but you will have to purchase a glue gun separately. The company backs this product up with a 2-year warranty. Here are some of the most common types of DIY dent pullers. All of them are pretty simple to use. Some take a little effort on the user’s part but others use leverage to work. A slide hammer dent puller is a dent pulling tool that can handle quite a bit of pulling force. It usually has a T-handle and a long straight body. There is also an attached tubular piece in the middle that ‘slides’. This tubular piece helps to create additional force so the user does not have to rely only on their own brute strength to pull the dent out. This is a type of dent puller that uses leverage to pull out a dent. The user has to exert very little effort to pull a dent out this way. It’s a dent puller that has two support legs that are attached to some kind of flat bar. There is also a screw mechanism in the middle of it. The screw mechanism attaches to a glue pad which is stuck on the car body. When the bridge dent puller is placed over the dent and connected to the glue pad, you then just simply use the screw mechanism to slowly pull out the dent. A golden dent puller is actually a slightly more sophisticated and easy to operate bridge type dent puller. The big difference is instead of using a screw mechanism to pull out a dent it uses a trigger style handle to do it. It too uses leverage to work a dent out effortlessly. As you squeeze the trigger on the golden dent puller it creates the pressure necessary to pull a dent out. There is nothing mechanical about the dent pulling process when using a suction style dent puller. 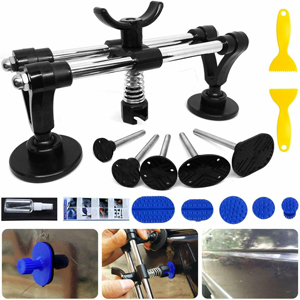 This type of dent puller latches onto your car’s body just by using strong suction. Once latched on, you then just use your own brute strength to tug on the dent puller to get the dent out. 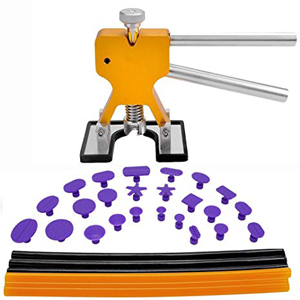 Every type of DIY dent puller mentioned above except a suction style dent puller uses plastic glue tabs or rubber/metal drawing gaskets to help you get a dent out. These glue tabs usually come in a variety of different sizes. This is necessary to help you pull out different size dents. It stands to reason that the more glue tabs you have the more options you will have when it comes to dent pulling. Keep in mind too that not all glue tabs are made the same. When using a glue tab to pull out a dent they tend to break on occasion. That’s why it’s never a bad idea to look for a dent puller that comes with reinforced or extra thick glue pads. It’s a pretty safe bet if you are using a DIY dent puller you don’t have much experience with them. That makes it ultra-important that they come with good directions for their use. The better the directions that come with a dent puller the better chance the job will turn out good. So read reviews and then go to the manufacturer’s website to make sure good directions come with your dent puller. 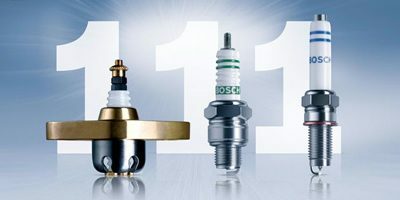 Bridge dent pullers, golden pullers, and slide-hammer dent pullers use glued tabs or gaskets to work. That means you will need a glue gun to apply the hot glue onto the glue tab or drawing gasket. It makes it really convenient if this glue gun is included in your dent pulling kit. This is a hammer used to flatten a body area out almost perfectly after it has been pulled out. Make sure you know how to use it before trying it out. You will hear us mention several times in this article the importance of cleaning around a dent. That makes it easier to attach glue tabs, drawing gaskets or suction style dent pullers to your vehicle’s body. If the alcohol and soft cloth required to clean the surface come in your kit it’s a nice bonus. If you have read our articles on the best trickle charger, you know we like products that come with their own carrying bags. That applies here too. Most dent pullers come in kits with many pieces. A carrying bag helps to protect, move and store your dent puller and its accessories. Most dent pullers are very reasonably priced. That still does not make them a disposable item. So if you can get one with a decent warranty it will give you more confidence in your purchase. When using a paintless DIY dent remover there is no drilling into the car body to get out a ding or dent. So when the dent is pulled out it leaves no damage to the vehicle’s surface and no painting is necessary because of this. Is glue-pull dent repair safe? It happens to be very safe. There are no sharp tools or high powered tools used in the process. The only thing you have to worry about is being careful when using hot glue. This process also does no harm to your vehicle’s bodywork if it is done correctly. What are the differences between paintless dent removal and traditional dent repair? Traditional dent repair by professionals often involves invasive procedures such as drilling into a car’s body. That means some body-filling and touch up paint will need to be done after the dent is pulled out. Paintless dent removal is non-invasive so no painting or body filling is usually necessary after a dent is removed. Why or Why Not to Use a Certain Type of Dent Puller? Here are some of the reasons to choose or not to choose each type of dent puller. Can fix a wide variety of dent sizes. Step 1: Preparation – thoroughly clean the dent itself and the area around with alcohol and a soft, non-abrasive type cloth. Pay close attention to make sure there is no grease, oil or other residues on the car’s body. Step 2: Attach the suction portion of the dent puller on the car body. Do this in a way that it totally covers the dent area. Make sure it’s firmly attached. Step 3: Use slight tugs on the suction dent puller to take out the dent a little at a time. Step 2: plug in the glue gun and add a glue stick. Allow the glue to warm for 5-minutes. Step 3: Select a proper size drawing gasket or glue tab according to the manufacturer’s instructions. The bigger the dent the larger the drawing gasket or glue tab it will need. Step 4: Apply the hot glue to the bottom of the glue tab or drawing gasket. Some have application holes in them for this. Quickly place the drawing gasket or glue tab in the center of the dent or ding. Allow 8-10 minutes for the glue to cure. Step 5: Align your bridge style, golden or slide-hammer dent puller so the center rests over the glue tab or drawing gasket. Next, attach the dent puller to the gasket. Step 6: Use your dent puller as instructed to slowly work the dent out. Step 7: Once the dent is gone, buff out the newly raised area with a soft cloth. Question: Will drilling a hole in the sheet metal of your car help you pull out a dent easier? Answer: The answer here is yes. With that being said, I would never recommend anyone who is a non-professional drilling a hole in their vehicle to get a dent out. That’s because if you do this type of dent removal wrong, you can actually make things much worse. The price of the subsequent professional dent repair will go up much higher too. Question: When is a dent too deep to pull out yourself? Answer: We look for a few different things before we try to pull out any dent. If your dent has any of the following factors that means it’s best left to a professional to pull out your dent. 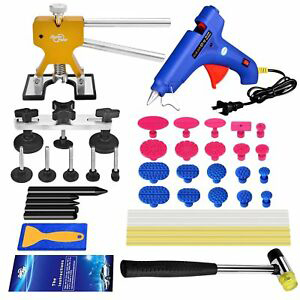 If you are not making progress pulling out your dent, even though you are closely following the instructions that came with your DIY dent pulling tool, then stop and take your vehicle to a professional body shop. Question: Do DIY dent pullers leave a perfect finish where the dent was? Answer: The answer here is no in most cases. However, if you work slowly and carefully, the area where you pull out the dent will most likely not be visible to anyone who is not a professional bodyworker. This will save you much money too. 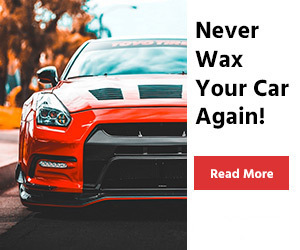 That’s why DIY dent pulling kits are so popular. Question: Any tips on the secrets to getting a DIY dent puller to work? Answer: For the most part you just have to closely follow the manufacturer’s instructions for your particular dent puller. These may be simple tools but they work really well for pulling out small dents if you follow the instructions. One thing that we all stress a lot here is to prepare your vehicle’s dent area properly. You absolutely have to make sure you clean the surface around the dent so it’s free of dirt, grease, and oils. We also feel you will get better results if you work slowly and pull your dent out just a little at a time. Check with our homepage to see if you’ve missed anything important! If you have a small dent in your vehicle, then you can save money by pulling that dent out yourself. The best dent pullers will help you easily accomplish that. They are usually very simple to operate and come with thorough instructions too. Anyone with even slight mechanical ability can use them. Be careful when shopping for a new dent puller though. There are many choices in the auto marketplace and not all our good quality. Use our dent puller reviews as a guideline as to what makes a quality dent pulling kit. 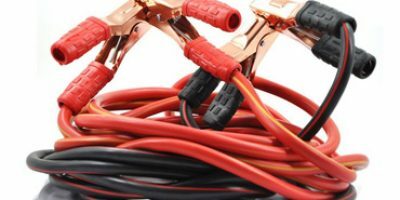 We also suggest you take the advice in our buying guide while shopping for a new DIY dent puller. If you do these things you should have no problem finding a good quality car dent puller.